Johnson Creek Watershed Council’s Creek Crew Leaders lead groups at restoration events during planting season. Our Creek Crew Leaders are a HUGE piece of our restoration work at Johnson Creek! We work with thousands of volunteers each year and with a small staff, we can’t function without the community support of volunteers like you to teach and lead in our restoration events! These leaders help guide groups of 5-15 volunteers for our native plantings, invasive species and trash removal parties throughout the year. 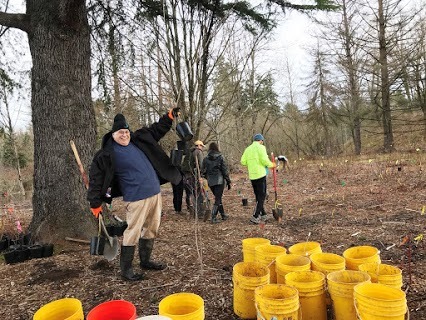 They are also a crucial element of our larger events such as our Watershed Wide Event (March 2, 2019) and the Johnson Creek Clean-Up (August 24, 2019). JCWC’s Creek Crew expands our capacity for facilitating restoration events throughout the year – we couldn’t do it without you! -Get a sweet Johnson Creek Beanie! During our one-day training we’ll cover running the registration table, safety talks, and tree planting demos, and send you home with a take-home manual and an awesome JCWC Creek Crew beanie! Creek Crew leaders help to facilitate a minimum of four restoration events during the planting season. **Must be 18 or older to lead–but adult-kid teams are welcome–mother-son, father-daughter, mentor-mentee, etc welcome!!! Check out this great video from out 2018 Creek Crew Orientation! Thanks to our videography team Sam Friedman, Will Floor, and David Pickar for putting it together!